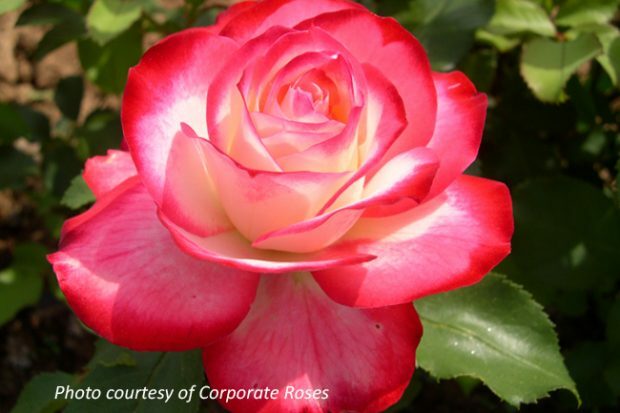 This rose was bred by Alain A. Meilland, Meilland International, in Antibes, France in 2000 and was released in the USA in 2003 as “Cherry Parfait™”. It was introduced in Australia in 2008 as “Fire & Ice”. “Fire & Ice” performs differently in different countries and climatic conditions as the amount of vigour varies but importantly it has the ability to withstand very hot climates and very cold climates. Alain Meilland wrote this rose “has withstood temperatures below minus 10’C” proving its hardiness, however, it also grows extremely well on the Adelaide Plains and can tolerate our hot summers with temperatures reaching 40’s Celsius. Combine this with excellent disease resistance, especially in respect to Powdery Mildew, and you have a very successful modern rose that has received awards in trials around the world and was chosen as AARS (All-America Rose Selections) Rose of the Year in 2003. This attractive healthy bush produces blooms with bright cherry red tips on creamy white petals creating an eye-catching, bi-coloured effect, accompanied by slightly glossy dense green foliage. The classic shaped blooms have good form, with a light sweet floral fragrance, that last well when used as a cut flower. This compact bush grows to just over 1m tall x 80cm wide and is quick to repeat flower in flushes throughout the entire growing season. In South Australia, if the rose is disbudded, it will produce a medium sized flower of approximately 40 petals and will be of good exhibition quality. Flower heads left untouched can produce clusters of 3 to 5 flowers forming a good Floribunda head and as it is registered as a Grandiflora both forms are acceptable. This attractive bi-coloured rose makes an excellent bedding plant or a beautiful specimen plant. This rose is available from Wagner’s Rose Nursery, Newman’s Nursery and Treloar Roses.